Total Area : 392.5 sq. kms. Ranthambhore National Park ( core ) 274.50 sq. kms. 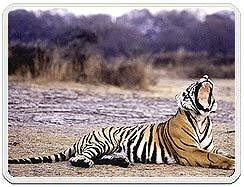 The Ranthambore National Park is situated near the town of Sawai Madhopur, midway between Bharatpur and Kota townships. The entire area has sprawling tracts of desert and semi-desert vegetation. Originally a hunting ground of the Maharaja of Jaipur, Ranthambore was declared a game sanctuary in 1955. 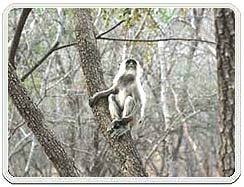 In 1980s, it became a national park and was listed among the reserves protected under Project Tiger (1973). Presently the Kaila Devi Sanctuary, also famous for its tigers and the ManSingh Sanctuary form a part of Ranthambore Reserve. The lakes and water holes in the Ranthambore national park are the best places to sight the animals. These water bodies are full of lotus and water lilies. Ranthambore also has a sizeable bird population, both resident and migratory. There are about 264 species of birds found within the park. Indian Hare, Mongoose and Monitor Lizards can also spot. 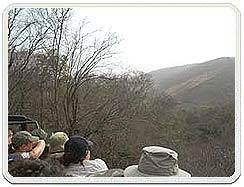 The most fascinating and most popular excursion taken from the national park is to the Ranthambore Fort. This fort was built by the Chauhans in the 10th century. The fort is located at a very strategic position between north and central India and hence it was always coveted by many rulers. This fort is famous for the 'Johar' (suicide by immolation to escape humilitaion) by Rajput women in 1301AD during the siege by Ala-ud-din Khilji. The temples and tanks add to the beauty of the fort. The seven gates and massive curtain walls, crowning a fall-topped hill presents a majestic view. The park is toured by a jeep or a lorry, the reservation of which can be done at the Project Tiger Office at Sawai Madhopur. The tours is accompanied by a guide. There are numerous accommodation facilities near the Ranthambhore National Park. The hotels here range from heritage to luxury and deluxe and budget category. 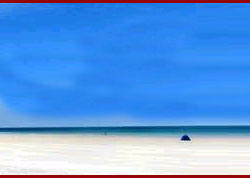 All the hotels are well appointed with world class facilities and services. The sanctuary can be conveniently visited from all the accommodations available. The scrubby landscape of Ranthambhore National Park features dry deciduous forests with trees of Dhak, Acacia, Ber and Salar. Ranthambhore is the home of Royal Bengal Tigers. One can easily sight the elusive tigers in their natural moods. Other residents of the park are the Antelopes, Nilgai, Sambhar and Chital, which are easy to find. Those who are lucky enough get to see the Sloth Bear, Wild Boar, Chinkara, Porcupines and Jackals, Leopard, Jungle Cat and Marsh Crocodile. The lakes and water holes within the Ranthambore National Park are the best locations to sight the animals. Indian Hare, Mongoose and Monitor Lizards can also be spotted here. Ranthambore also boasts of a respectable size of bird population, both resident and migratory. There are about 300 species of birds seen within the park. The most spectacular site within the park is the Ranthambore Fort. This 10th century fort was built by the Chauhans is famous for the 'Johar' (suicide by immolation to escape humiliation) by Rajput women in 1301 AD during the siege by Ala-ud-din Khilji. The temples and tanks add to the beauty of the fort. The seven gates and massive curtain walls, crowning a fall-topped hill presents a majestic view. Which is a rail terminal, serves as the vital link to Ranthambhor, and offers accommodation for visitors. The park is closed in the peak summer and monsoon months. Air : The nearest airport is that of Jaipur, which is about 145 km away. There are regular flights of various airlines to this place. Rail : Sawai Madhopur, the nearest town from the park provides the nearest railhead for the national park. It is 11 km from Ranthambore. Road : From Jaipur one has to take the road to access the national park.